Metal Garages Direct offers metal garages to the entire state of Oregon OR. 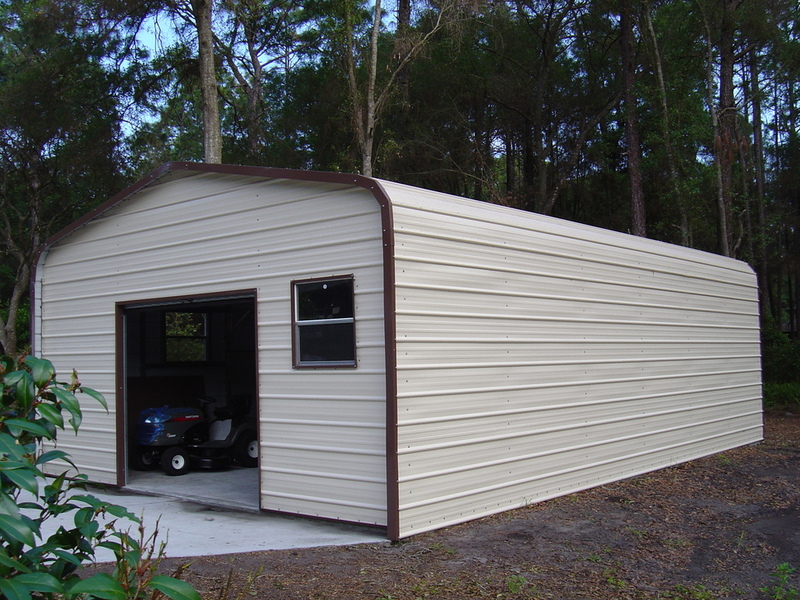 We offer our Oregon metal garages in many different sizes starting at 12' wide up to 30' wide and as long as you want. Our garages are available in up to 12' side height. Our Oregon OR metal garages are available in 13 different colors! In addition Oregon OR metal garages are available in both 14 ga(no warranty) or 12 ga(20 year rust through limited warranty) and come standard with 29 gauge paneling. Oregon steel garages are available in both certified and non certified. We also offer carports, metal barns and steel buildings! Our metal garages are great for storing cars, trucks or tractors. A Oregon steel garage helps protect your assets from mother natures unpredictable weather. ​Unlike most companies we display our prices for you to see so check out our garage packages below! Our Oregon metal garages are delivered and installed for free as long as your ground is level. Our normal delivery time for Oregon are is 3-6 Weeks and up to 8 weeks. So if you are looking for a great metal garage or steel garage at a great price with quality service then give us a call toll free at 1-877-662-9060 or email us: sales@mayberrymetalstructures.com. ​Adair Village OR, Albany OR, Aloha OR, Amity OR, Ashland OR, Astoria OR, Athena OR, Aumsville OR, Aurora OR, Baker City OR, Bandon OR, Banks OR, Barview OR, Bay City OR, Beaverton OR, Bend OR, Boardman OR, Brookings OR, Brownsville OR, Bunker Hill OR, Burns OR, Canby OR, Cannon Beach OR, Canyonville OR, Carlton OR, Cascade Locks OR, Cave Junction OR, Cedar Hills OR, Cedar Mill OR, Central Point OR, Chenoweth OR, Clackamans OR, Clatskanie OR, Coburg OR, Columbia City OR, Coos Bay OR, Coquille OR, Cornelius OR,​ Corvallis OR, Cottage Grove OR, Creswell OR, Culver OR, Dallas OR, Damascus OR, Dayton OR, Depoe Bay OR, Drain OR, Dundee OR, Dunes City OR, Durham OR, Eagle Point OR, Elgin OR, Enterprise OR, Estacada OR, Eugene OR, Fairview OR, Florence OR, Forest Grove OR, Four Corners OR, Fruitdale OR, Gearhart OR, Gervais OR, Gladstone OR, Glide OR, Golden Beach OR, Gold Hill OR, Grand Ronde OR,​ Grants Pass OR, Green OR, Gresham OR, Happy Valley OR, Harbor OR, Harrisburg OR, Hayesville OR, Heppner OR, Hermiston OR, Hillsboro OR, Hines OR, Hood River OR, Hubbard OR, Independence OR, Irrigon OR, Island City OR, Jacksonville OR, Jefferson OR, John Day OR, Joseph OR, Junction City OR, Keizer OR, Keno OR, King City OR, Klamath Falls OR, La Grande OR, La Pine OR, Lafayette OR, L Oswego OR, Lakeside OR, Lakeview OR, Lebanon OR, Lincoln Beach OR, Lincoln City OR, Lowell OR, Lyons OR, Madras OR, McMinnville OR, Medford OR, Merlin OR, Metzger OR, Mill City OR, Milton-Freewater OR, Milwaukie OR, Mission OR, Molalla OR, Monmouth OR, Mount Angel OR, Mulino OR, Myrtle Creek OR, Myrtle Point OR, New Hope OR, Newberg OR, Newport OR, North Bend OR, North Plains OR, Nyssa OR, Oak Grove OR, Oakridge OR, Odell OR, Ontario OR, Oregon City OR, Pacific City OR, Pendleton OR, Philomath OR, Phoenix OR, Pilot Rock OR, Port Orford OR, Portland OR, Prineville OR, Rainer OR, Raleigh Hills OR, Redmond OR, Reedsport OR, Riddle OR, Rockaway Beach OR, Rogue River OR, Rose Lodge OR, Roseburg OR, Saint Helens OR, Salem OR, Sandy OR, Scappoose OR, Seaside OR, Shady Cove OR, Sheridan OR, Sherwood OR, Siletz OR, Silverton OR, Sisters OR, Springfield OR, Stanfield OR, Stayton OR, Sublimity OR, Sunnyside OR, Sunriver OR, Sutherlin OR, Sweet Home OR, Talent OR, Tangent OR, Terrebonne OR, The Dalles OR, Tigard OR, Tillamook OR, Toledo OR, Tri-City OR, Troutdale OR, Tualatin OR, Turner OR, Umatilla OR, Union OR, Vale OR, Veneta OR, Vernonia OR, Waldport OR, Warm Springs OR, Warren OR, Warrenton OR, West Linn OR, West Slope OR, White City OR, Willamina OR, Williams OR, Wilsonville OR, Winchester OR, Winston OR, Woodburn OR, Yachats OR and Yamhill OR!